Oh my! This is an area of constant growth. Growth of my bag collection, that is! As with most photographers, I am in constant pursuit of the "perfect" camera bag. I know. I know, Such a thing doesn't exist, but that does not stop me from looking! This is my most recent purchase and a bag larger than I thought I wanted. A messenger type bag, the Retrospective 30 allows me to carry pretty much all the gear I typically want to take when we go on a trip. Therefore, it is a bit heavy, but - surprisingly - comfortable to carry. This is a Vanquish tactical gear messenger bag that I plan to use as my "everyday" bag. Nice features include a top access zippered opening and the ability to use the bag in a "Short," "Medium," and "Tall" configuration. The Vanquest V-Slinger sling type bag is actually a tactical gear bag, but works very nicely as a camera bag. This is my trusty Eagle Creek shoulder bag that I have had for over 25 years. 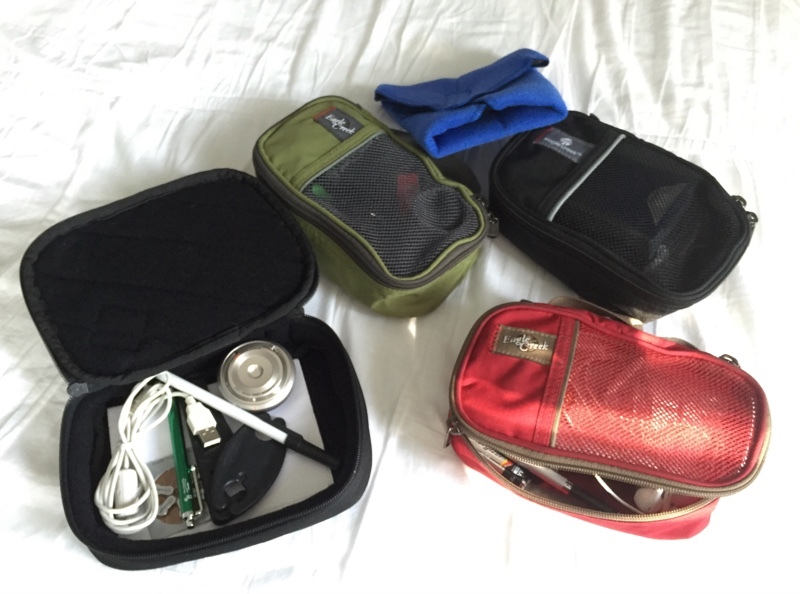 It packs easily in carry-on luggage and becomes a great day bag when traveling. This is a medium sized shoulder bag that is very handy with many storage areas. It is just a bit small sometimes, thus I ordered the Vanquest SKITCH-12 as an alternative. The original Passport Sling should bag, this is another bag I can compress and pack in checked bag to use a s day bag when traveling. It provides more space and flexibility than the Eagle Creek bag and is very comfortable to carry. The Lowepro Photo Hatchback is another very versatile backpack type camera bag. I now use it exclusively to carry my flash related gear. This little shoulder bag is like a small purse but will hold my Panasonic GM-5 camera with its 12-32mm lens, battery charger, two batteries, and my Olympus 25mm and Panasonic 35-100mm, f/4-5.6 lenses! 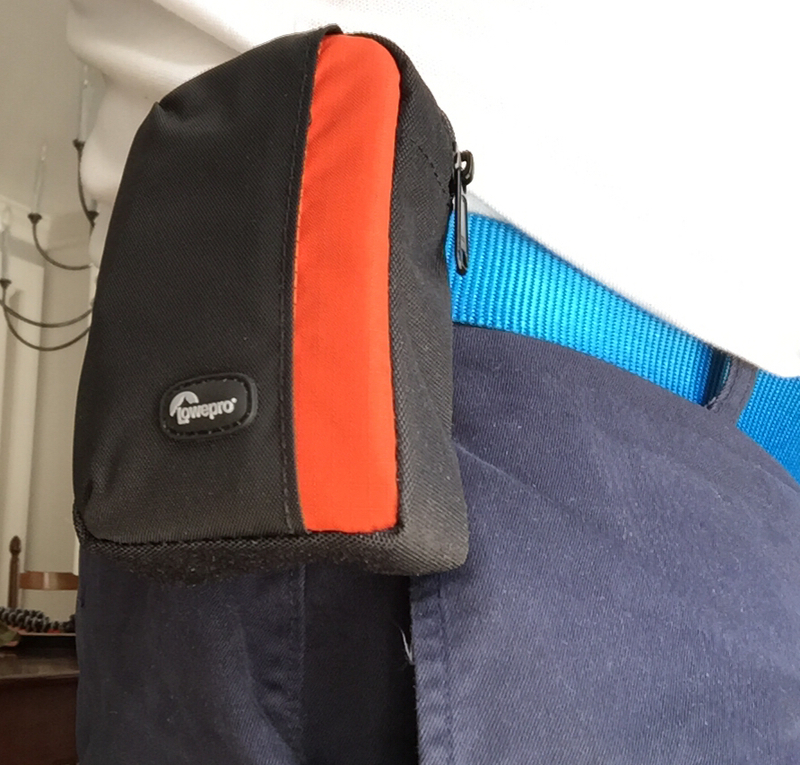 This small Lowepro bag is perfect for smaller cameras. I use it now to hold my Yi Action Camera, its plastic, waterproof case, and the charging cable. I have several of these small accessory bags from Eagle Creek, each in a different color. They are great for modularizing your equipment so you can pull one out of one larger bag and stick it in another bag. For example, the black one has chargers and batteries plus cables and small pop-on flashes for my two main cameras. These Domke Wraps come in three different sizes and are great for wrapping your lenses for more protection. The largest one will even wrap my Olympus OM-D E-M1!